Check Out These Best Sellers! 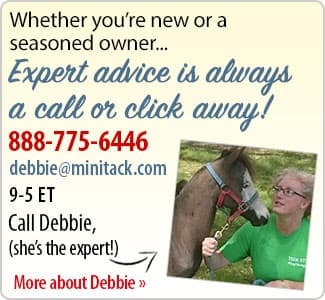 Welcome to MiniTack.com, your online source for products designed specifically to meet the unique needs of miniature horses, ponies, and donkeys, and their owners too! From vaccines and supplements to equipment and – of course – tack, you can find everything you need right here, from top brands and at value prices. We’re passionate about our minis, and we understand how special they are. We love your enthusiasm for minis and ponies, and that’s why our priority is to provide the best and widest assortment of solutions for you, accessible with just a click. If you need to speak to an expert, our customer service professionals are here to help. Keep an eye on our site as we grow, and be sure to sign up for our mailing lists and follow us on social media—that way you won’t miss out on the latest products, deals, sales, and events.